What did I wear for Memorial Day? Well red, white, and blue of course! We had gorgeous weather for Memorial Day Weekend...sunshine and 70 to 80 degree temperatures! How often does that happen? It's usually cold and rainy. 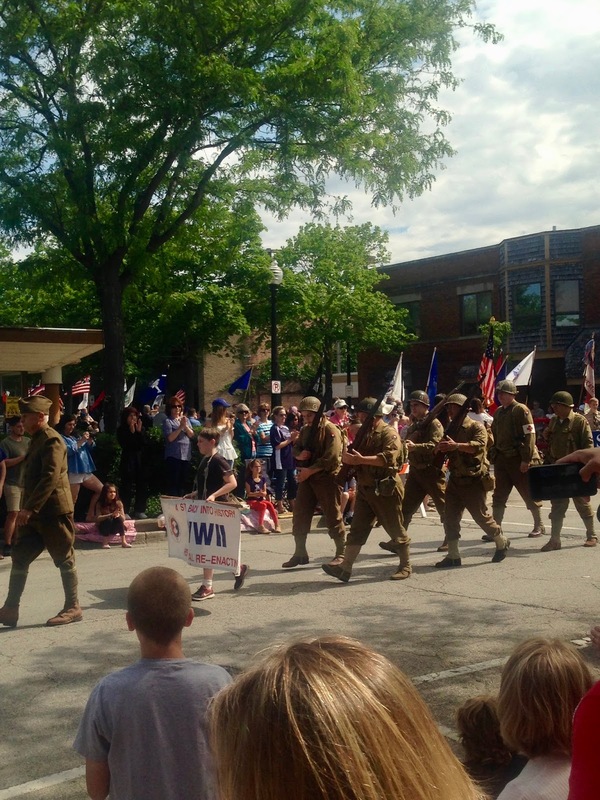 We celebrated Memorial Day in Wheaton, Illinois with our kids. We went to the Memorial Day Parade, then to Cantigny Park, and finished the day at the shopping mall scooping up Memorial Day sales! I wore a new red and white plaid sleeveless top from CJBanks, blue skinny jeans, and my Adidas NEO Courset Sneakers. The top is very lightweight so it keeps me cool and comfy in the hot temperatures. I think it will be a great layering piece in the fall by adding a denim jacket or cardigan over it. It is longer in the back than it is in the front, so it's very flattering. I can't wait to try this top with a pair of Bermuda shorts too! The top is gathered slightly at the shoulders and has an attractive v-neck-line. It also has a half button placket, so I can open it up to reveal a tank underneath if I want. 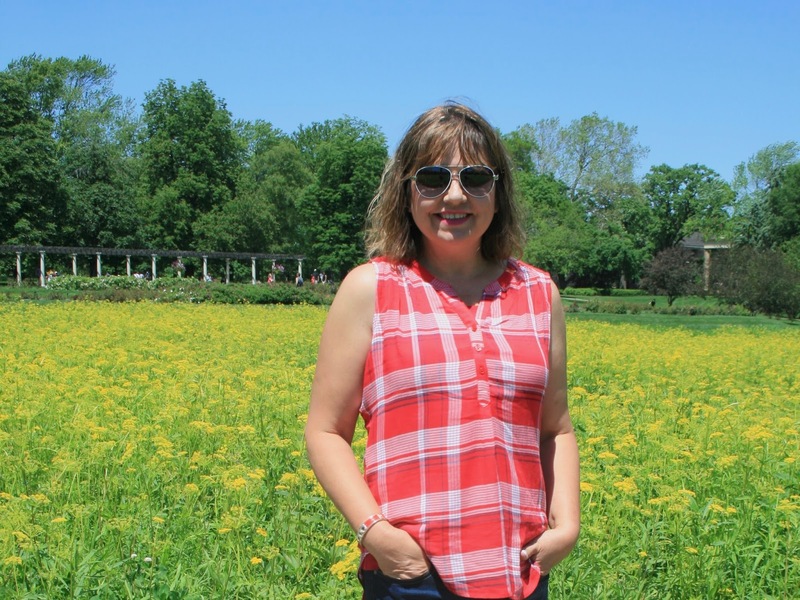 These pictures were taken at a wildflower field in Cantigny Park. I will share more about this beautiful park in a future travel post. 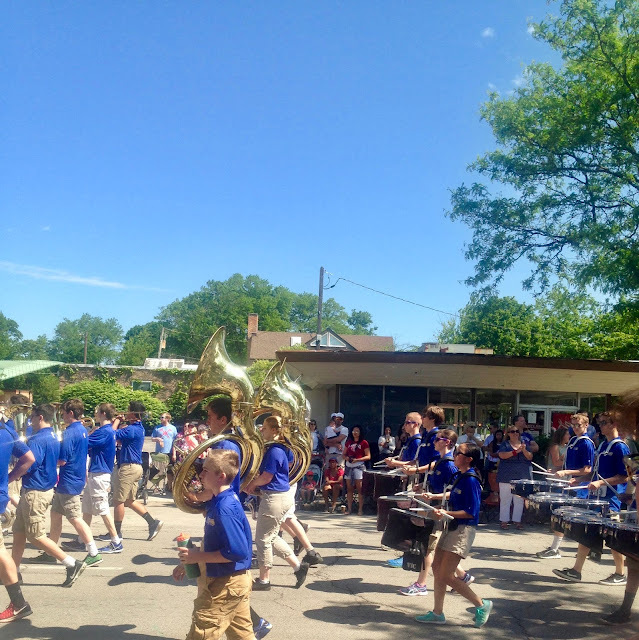 But I did want to share with you how much fun we had at the Wheaton Memorial Day parade. We couldn't believe how many bands they had and how amazing they were! We were also very impressed with the turn out for the parade. 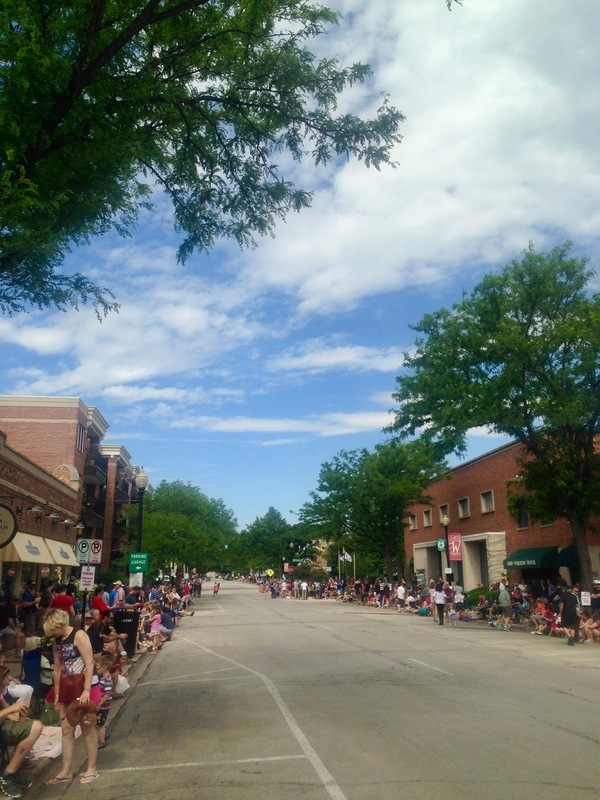 This is downtown Wheaton as we await for the parade to begin. I loved listening to all the patriotic music the bands were playing. It was so wonderful to see people take some time to appreciate our veterans and celebrate our great nation! That's a great Memorial Day outfit, Amy! It looks and sounds like you had a great Memorial Day! Thanks Andrea! It was a fun day! We really enjoyed the parade! What a great combination for Memorial Day! The wildflower field looks beautiful! Sounds like a great Memorial Day! I haven't been to a parade (unless you count the one at Disney- lol!) in a long time! I love that top and I always love when they are a little longer in the back. It will def. be a nice to layer over in the fall, too! Thanks Carrie! I think parades are small town favorites because there isn't as much going on as there is in a big city. And yes, I love tops that are longer in back and I'm looking forward to carrying this top into the fall with an outer layer. Thanks Elli, I was surprised at how many people were there. 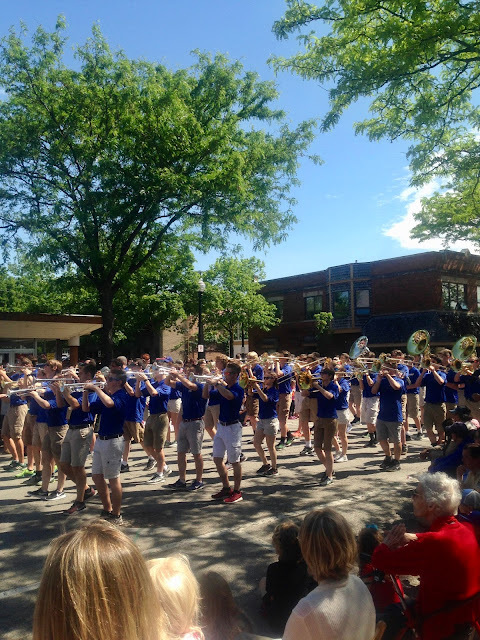 The Memorial Day festivities in my small town do not get this well attended. Yes, it's always sad when the kids get too old to run for the candy, but we still enjoy going to see everything! You look so cute and festive! I love that top! We spent our day in the yard doing yardwork. Now I think we need to have a nice BBQ to enjoy all our hard work. Thanks Laura! Sorry you had to do yard work on Memorial Day. I hope you can enjoy a BBQ soon! I haven't been to a Memorial Day parade in ages. I need to make it a point to go next year! Your top is so cute! Love this festive look! Thanks Jill! I hadn't been to one since my kids were in high school, but I made it a point this year as I've been so upset about what's been going in our nation lately. Love how subtle this red+white+blue outfit is. I am glad you got the sneakers. Love my Adidas Neo's and want a second pair (the navy). Have a great week Amy! Thanks Ada! I agree on the subtlety. Too patriotic looking wouldn't be for me. Perfect outfit for Memorial day! Love the top. Love your top contrasted against the yellow fields. Thanks for linking up with the Blended Blog. It's amazing! No matter what you wear you always look so cute! Great look. Thanks for joining our Ageless Style linkup party. Thanks! Since I normally wear just casual clothes, I need to hear that! Great look in red-white and blue. That works also for the 4th! Thanks for joining the Top of the World Style linkup party.